April 20, 2019, Update: Firefighters got an earlier start today with ignitions on the Pingree Hill portion of the Elkhorn-Pingree Hill Prescribed Burn. Expect smoke to be visible in the Poudre Canyon and along Highway 14. Yesterday firefighters successfully burned 150 acres. The Elkhorn - Pingree Hill Prescribed Burn is located in the Poudre Canyon. Firefighters burned portions of Pingree Hill in 2014, 2016, 2017 and 2018. No burning has taken place yet on Elkhorn. The Pingree Hill Prescribed Burn is located northeast of Rustic at the intersection of Highway 14 and Pingree Hill road, south of Kelly Flats Road and is 1,913 acres. 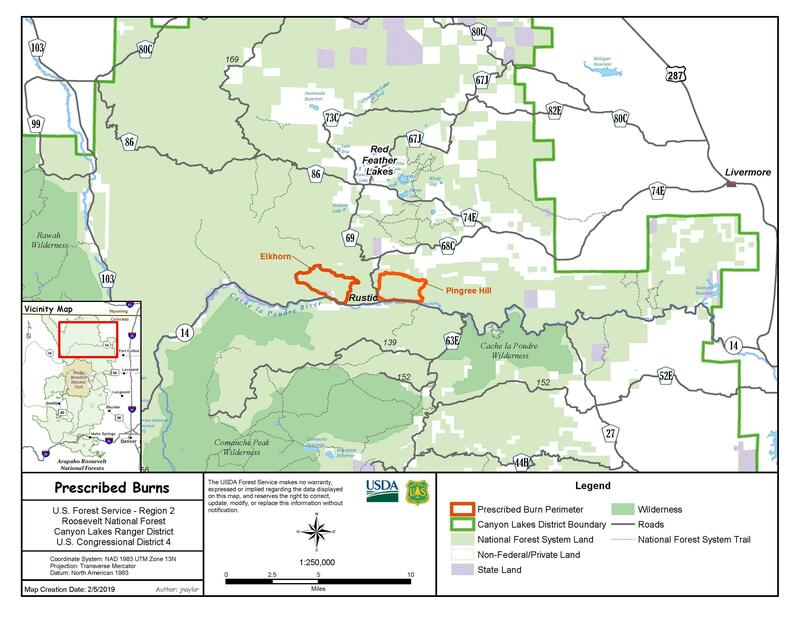 The Elkhorn Prescribed Burn is located approximately two miles northwest of Rustic, south of Sevenmile Road, above the Arrowhead Visitor Center and is 2,191 acres. Appropriate conditions must be met before ignition of prescribed burns can take place. Fire managers are carefully monitoring these conditions, including a favorable weather forecast (temperature, wind, precipitation, etc. ), fuel moisture, smoke dispersal and staffing. Weather is monitored throughout the burn and burning will be halted if conditions fall outside of the required conditions. In ideal conditions, as many as 500 acres could be burned in one day. The goal of the burn is to reduce hazardous fuels and improve wildlife habitat. 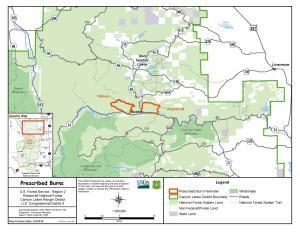 Work has already taken place within this project area to help ensure the burn stays within its identified perimeter. Prescribed fire smoke may affect your health. For more information see https://www.colorado.gov/pacific/cdphe/wood-smoke-and-health. To check the latest updates on when this burn will occur, check our recorded incident information line at 970-498-1030 or follow us on Twitter @usfsclrd. To get added to the email notification list, send an email to rcloudman@fs.fed.us. If you have specific questions related to this prescribed burn, please contact Reghan Cloudman at 970-295-6770. Incident Description Prescribed Burn To Reduce Hazardous Fuels And Improve Forest Health And Wildlife Habitat.